Designed for day to night and low distortion applications, this varifocal day and night high-resolution lens uses Kowa's eXtra-low Dispersion glass and aspherical technology, making it perfect for high end surveillance applications. This lens, with a metal body, has locking screws to keep the iris and focus in position. 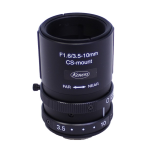 When combined with a 8 mm sensor, it offers a zoom ratio of 2.85x. THIS LENS HAS BEEN DISCONTINUED BY THE MANUFACTURER.